[THE INVESTOR] Korea Economic Research Institute, a state-run research organization, anticipated that the digital signage market would create around 70,000 jobs by the year 2020. The digital signage is a large-size digital board, often made of organic light-emitting diode or liquid-crystal displays. The boards are used to display images, videos and textual information. The signage segment will spark 10.1-trillion-won ($8.7 billion) worth of production and create 3.2 trillion won in added value, according to the KERI report. 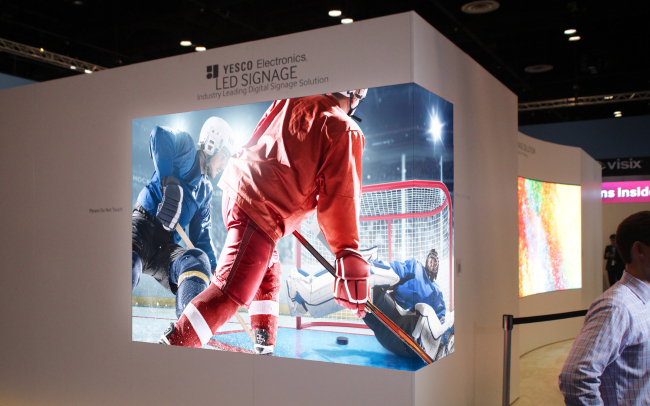 A digital signage display of Yesco Electronics, a signage firm acquired by Samsung Electronics in March 2015. Samsung Electronics and LG Electronics, along with their respective affiliates Samsung Display and LG Display, are trying to expand their foothold in the world’s signage market. “Transit shelter ads fitted with digital technology such as interactive digital signage boards have been garnering a great deal of attention in the ad market,” said Kim Young-shin, a researcher at the KERI. The Korea’s entire ad market is valued at 10.7 trillion won, slightly up from 9.4 trillion won in 2012. The mobile ad segment has grown sixfold from 210 billion won in 2012 to 1.28 trillion won in 2015. The market size of newspaper ads decreased from 1.65 trillion won to 1.5 trillion won in the same period while that of the terrestrial TV ads grew from 1.93 trillion won to 1.97 trillion won. The KERI researcher recommends the Korean government relax regulations on the smart ad sector utilizing digital signage.